Whilst Web Intelligence (Webi) may not necessarily the first tool which comes to mind for developing visually engaging analytics, with some creative flare, we’re not limited to delivering analytics and reports in Webi that appears as mainly of tables and crosstabs. The purpose of this post is to share some visualisation techniques which I’ve used whilst developing some Web Intelligence (Webi) reports which have a slight dashboard flavour. Please bear in mind whilst reading through that the primary focus of this post is not on tool selection nor discussing the strengths/weaknesses and features of Webi in comparison to the other tools within the BusinessObjects product suite. This post is purely intended to showcase some visualisation techniques which can be achieved using WebI and providing some tips and tricks on how they were achieved. 1. 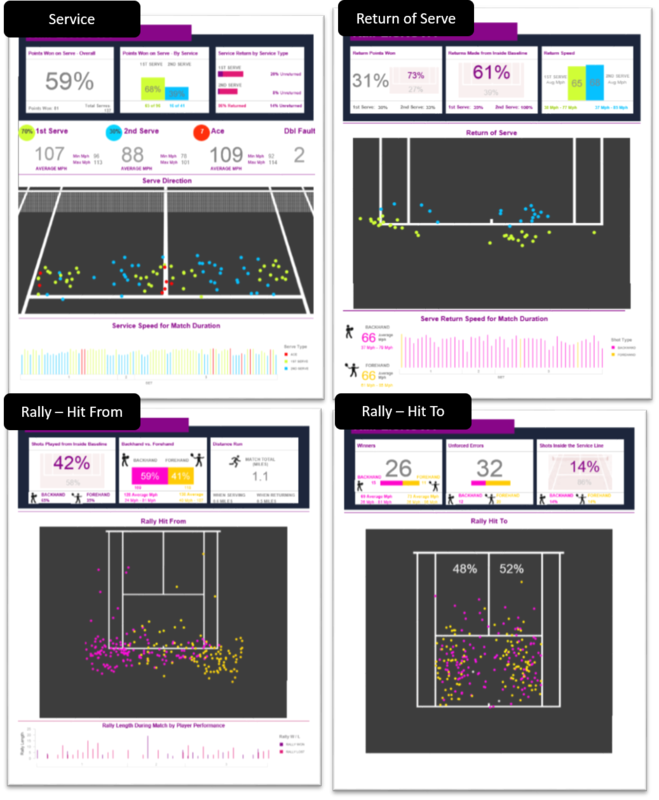 Include a series of visual charts/graph which plot the service, return of serve, and rally shot/ball landing points on the tennis court (ie. reproduce the ball plotting images as seen in televised matches). The KPI tiles which appear at the top of each report tab are merely a series of free standing cells, vertical tables, and charts formatted and laid out in a certain manner to achieve the desired look and feel. The white background is a vertical table with the header row and 2 detail rows formatted with white background and no borders. The number of winners (26) was then formatted to allow room for the other objects to be placed inside the tile. 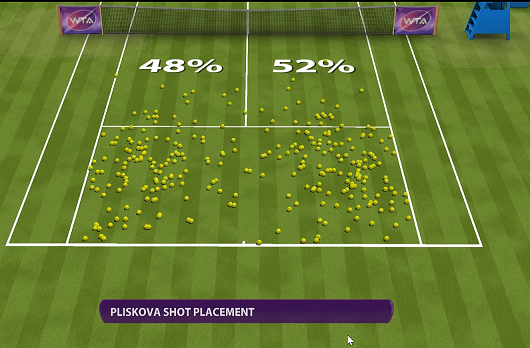 The pink and yellow horizontal bars you see providing the visual comparison between the number of backhand winners versus forehand winners is a bar chart formatted to show only the bars with no other chart properties enabled. The size of the chart has also been adjusted. The BACKHAND and FOREHAND labels and values (15 and 11 respectively) are two separate vertical tables with header and detail cells formatted with no background fill. The backhand and forehand tennis player icons are two separate free standing cells with the Appearance Pattern set to the image files as shown. And finally the speed information shown in the lower part of the tile is a single vertical table with the header row hidden and table formatted with no background fill or borders. All the tiles follow a very similar design convention. For example, the Shots Inside the Service Line tile is also a vertical table formatted with white background header and detail rows. Except, for this tile, the first detail row has a tennis court image set as the Appearance Pattern. And the percentages shown are displayed in a vertical table with no header row displayed and no background fill. Overlaid on top of the chart image is a scatter plot chart formatted to display the plotting points only, with all other chart properties disabled. As you can see from the samples provided, the entire report was achieved using a combination of free standing cells, tables, and charts – just formatted in a particular way to enable the objects to be overlaid on top of one another to achieve a more visual design layout.